Do you enjoy making things for other? Choose from the list below to share your passion for knitting and do something good for others that could really use your help! Use the charities listed below to look into knitting for others including America's Soldiers. Note: Charities marked with ** help veterans and soldiers currently serving. ChemoCaps - Knit hats to help make a cancer patient in the oncology unit and hospice program feel more comfortable. These caps allow the recipient to feel comforted knowing a knitter cared enough to hand knit a chemo cap for their head. Free chemo caps patterns are available on their website. Cubs for Kids - Provides "dressed" teddy bears for children in homeless shelters across the country. 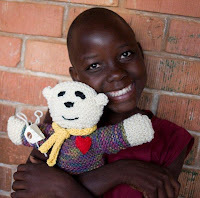 Cubs for Kids provides the bear cub and pattern for sweater, hat and scarf. You provide the yarn and knit garments for the bears. In early December, bears are dress, gift wrapped and donated to the children. Operation Toasty Toes **- This group of volunteers can use your help making knitted and crocheted items for soldiers in Iraq, Afghanistan, Greenland, Korea, Japan, Alaska - stationed on a base or on a ship. Free Patterns are available for the helmet liners, slippers, watch caps, headbands, and dickeys. Special Olympics Scarf Project - Knit scarves for the athletes, coaches, families and volunteers of the 2012 Special Olympics. Free patterns and official colors are posted on their website. Find even more charities to knit or crochet for at Make.Give.Repeat.